PT Pertamina EP - PEP or known as Pertamina EP is an established and experienced oil and gas company in Indonesia with strong business competencies on upstream oil and gas industry. Pertamina EP running business in exploration, exploitation operations, sale of oil and gas production resulted from exploitation activities. PT Pertamina EP is an upstream subsidiary company of state-owned energy giant PT Pertamina (Persero). As of December 2016, PT Pertamina EP is 99.99% owned by PT Pertamina (Persero) and 0.01% by PT Pertamina Dana Ventura. Headquartered in Jakarta, Pertamina EP has total working area under production sharing contracts (PSCs) of approximately 113,613.90 km2. Pertamina EP also supported by 21 field, 6 development projects, and 7 utilization areas. According to information found in PT Pertamina EP Annual Report 2016 as cited by JobsCDC.com, Pertamina EP reported total operating revenues from Crude Oil, Natural Gas and Liquefied Petroleum Gas (LPG) of USD 2,495 million in 2016. This number is down 14.67% from USD 2,924 million in 2015. Referring to its annual report, total comprehensive profit of Pertamina EP in 2016 amounted to USD 602 million or down 17.19% from USD 727 million in 2015. Minimum S1 majoring in Economic Law / Civil Law. Able to compile legal documents in the form of MoU, HoA, agreement and Agreement. Able to conduct evaluation and mitigation of agreement documents under applicable regulations to keep the Company from being exposed to risk. Experienced in the field of law in the Oil and Gas Industry. Have professional certification in Upstream Oil and Gas Industry that support the work (eg Advocat, PTK 007, tax brevet). Minimum S1 majoring in Chemical Engineering, Petroleum Engineering, Mechanical Engineering, Electrical Engineering. Minimum 6 years of experience in the related field (minimum 5 years in the field of commercial). Have strong understanding about the oil and gas production facilities. 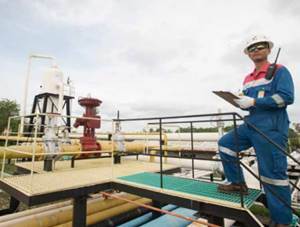 Have strong understanding about the flow assurance process in oil and gas production and transportation. Minimum S1 majoring in Chemical Engineering, Petroleum Engineering, Mining Engineering, Mechanical Engineering, Electrical Engineering. Minimum 5-6 years of experience in the related field (minimum 5 years in the field of production operation / drilling, oil and gas transportation / lifting). Not defective and not color blind. Minimum 5-6 years of experience in oil and gas industry (PSC, JOB, KSO or TAC). Minimum 5 years of experience in production operation, reservoir, commercial, business budgeting. Minimum S1 majoring in Informatics Engineering, Computer, Information Engineering. Minimum 4 years of experience in the related field (3 years in oil and gas industry on technology and communication technology). Have strong understanding about the Oil & Gas Business Process Map. Have strong understanding and engage in the implementation of IT compliance and business process continuity. Experienced in implementation and monitoring of ICT projects, IT services and solutions. Experienced in the management of multimedia, network & hardware infrastructure, incident management process and end user computing. Minimum S1 majoring in Engineering. Minimum 14 years of experience in the related field. Have a Project Management Professional (PMP) certification or participate in project management certification program. Have a PTK 007 / PTK 041 certification. Have strong understanding about the process and have been involved in the preparation of POD, WP & B, RKAP & AFE. Experienced in formulating the activity process strategy facilities, planning, and evaluation activities. Experienced in project controlling, scheduling and risk management. Minimum S1 majoring in Petroleum Engineering, Industrial Engineering, Mechanical Engineering. Minimum 5-6 years of experience in oil and gas company/TAC/KSO. Active communication and able to work together on a team basis. Mastering Ms. Office (Word, Excel, PowerPoint). Minimum S1 majoring in Petroleum Engineering, Industrial Engineering. Minimum 5 years of experience in oil and gas company. Minimum 5 years of experience in the field of Risk management and Supervision. Minimum S1 majoring in Mechanical Engineering, Civil Engineering, Electrical Engineering. Have experience as project leader. JobsCDC.com now available on android device. Download now on Google Play here. Please be aware of recruitment fraud. The entire stage of this selection process is free of charge. PT Pertamina EP - Staff, Engineer, Analyst, Senior Analyst Pertamina Group July 2018 will never ask for fees or upfront payments for any purposes during the recruitment process such as transportation and accommodation.